At Walker Movements, we have over twenty-five years of experience in the sale and export of used trucks, especially used trucks for sale to Ukraine. As we are a family business, we try to build strong relationships with our customers and do our best to make the process clear, easy to understand and convenient for them. For this reason, we handle as much of the paperwork as we can, so that you don’t have to. We would be happy to provide you with a quotation to get your truck delivered to a UK port, if this is the method of transportation you would like to use. Because we are a family owned business, we pride ourselves on our friendly approach and our emphasis on forming good relationships when it comes to customer service. Our team has worked for many years within the Ukrainian truck market and can provide help and assistance for all of your needs. If you are intending to ship your truck across the ocean, we can arrange the safe and insured transportation of the vehicle to our UK port in Dover. We offer this service at a competitive price and it will enable you to organise the final shipping to your desired port near Ukraine. Alternatively, many of our Ukrainian customers prefer to collect the trucks or trailers themselves from our UK head office, to then drive them safely across Europe under their own steam. 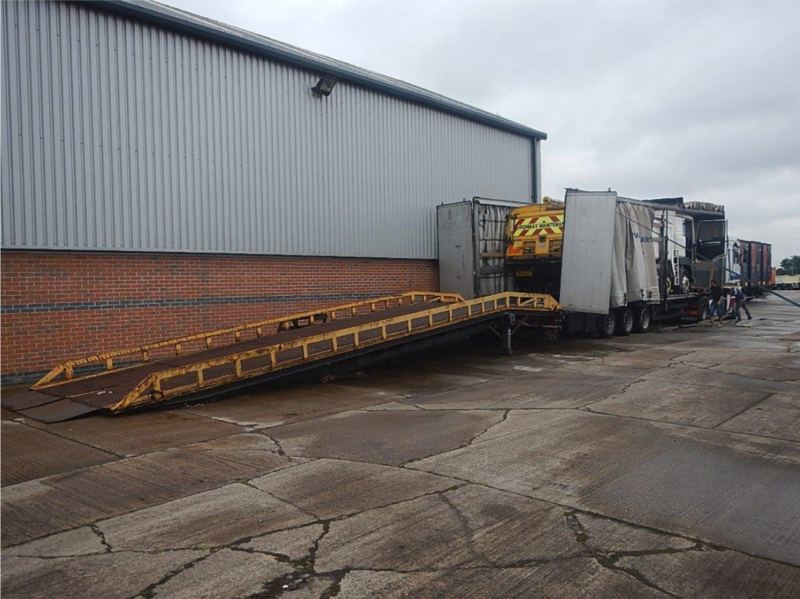 In fact, we are one of the few truck companies in the UK with a loading ramp, which has facilitated the loading of up to two tractor units/one rigid truck (e.g. a tipper) onto either a curtainsider or euroliner trailer for many satisfied customers. This means that you won’t be limited to taking just one vehicle at a time when you purchase from Walker Movements. Whichever option you choose, all of the required documentation for exporting from the UK will be completed by us in full and posted to your address with DHL tracking. Over the last 25 years, our family business has grown rapidly to become the best in the truck industry. Our headquarters in the UK are state-of-the-art and our facilities allow us to ship used trucks to Ukraine and all over the world. This means that any truck you see in stock on our website is eligible for sale to Ukraine and can either be collected in the UK or shipped for a fantastic price. Our specialist sales team make sure all of the enquires of used trucks for sale to Ukraine are answered quickly and effectively, ensuring the customer is well informed throughout the entire buying process. So if you have any questions, please contact our sales team - they’re always happy to help. Throughout our two decades of operating in the industry, we have sold over 25,000 trucks and have seen many different makes and models pass through our yard. Our used trucks for sale to Ukraine come from some of the best and most reliable brands in the industry, such as DAF, MAN, Scania, Volvo and Mercedes Benz, as well as many other well-established manufacturers. In our range you will find more than just tractor units; we also stock a large selection of steel tipper trucks, flatbed and tipping trailers, brick grabs and cranes. When viewing our stock, keep in mind that each used truck for sale to Ukraine has passed rigorous tests, completed by our technicians and have been confirmed as roadworthy. When you find your perfect used truck for the job, simply fill out the enquiry form below or contact us directly and we will get back to you as soon as we can. We would be more than happy to take your order for used trucks in Ukraine, either over the phone, via email or in person at our 21-acre state-of-the-art sales centre. Alternatively, if you see a vehicle you are interested in on our website, please do not hesitate to get in contact with us using our online form below. Please clearly state the truck or trailer you are interested in and the destination the truck is intended for. For any enquiries into the services we provide to Ukraine, or to book an appointment to view our stock, please contact one of our dedicated sales team. We look forward to speaking with you soon. When we visited the team at Walker Movements, we truly appreciated the quality of service that we received. Jamie really took the time to show us around the yard and talk us through all of our options. A big thank you to the staff that we dealt with and we hope we will have the opportunity to do business together again in future.